Lucia and Mercedes were instrumental in beginning Mujeres Libres in Madrid. Amparo joined them on the editorial board of Mujeres Libres and later became active in Barcelona as the director of Mujeres Libres’ education and training institute, the Casal de la Dona Treballdora. All three were spurred to action by their prior experiences in male-dominated organizations of the anarcho-syndicalist movement. But the groundwork for the organization was also being laid by women around the country, many of whom were virtually unaware of one another’s existence. In Barcelona, for example, Soledad Estorach, who was active both in her ateneo and in the CNT, had also found existing movement organizations inadequate to engage women workers on equal terms with men. In Catalona, at least, the dominant position was that men and women should both be involved. But the problem was that the men didn’t know how to get women involved as activists. Both men and most women thought of women in a secondary status. For most men, I think. The ideal situation would be to have a companera who did not oppose their ideas, but whose private life would be more or less like other women. They wanted to be activists twenty-four hours a day-and in that context, of course, it’s impossible to have equality …. Men got so involved that the women were left behind, almost of necessity. Especially, for example, when he would be taken to jail. Then she would have to take care of the children, work to support the family, visit him in jail, etc. That, the companeras were very good at! But for us, that was not enough. That was not activism!!! The responses to the call in Catalonia were similar to those Mercedes and Lucia received in Madrid-enthusiasm from some and ambivalence from others, both women and men. Many in movement organizations feared the development of a “separatist” group. Others framed objections in the form of a claim that the women were in danger of falling into “feminism,” by which they meant a focus on access to education and professional jobs. These types of issues, of course, had long been the concern of middle-class feminists, in Spain as elsewhere, but they had been rejected by anarchists as irrelevant to the concerns of working-class people, women as well as men, and as reinforcing structures they were committed to overthrowing. The charge of “feminism” mystified most of these anarchist women. Most of us had never heard of “feminism” before. I didn’t know that there were groups of women out there in the world organizing for women’s rights. There were some one or two within our group who had heard of feminism-they had been to France. But I didn’t know that such things even existed in the world! We didn’t import this from elsewhere. We hadn’t even realized it existed. Knowing that their agenda was not ‘°feminist” in this derogatory sense, they ignored the criticisms and went about their business as best they could. Early in 1936, they held a meeting in the Teatro Olimpia, in the center of Barcelona, to publicize their activities and provide an opportunity for new women to join. Although the meeting was virtually ignored by the anarchist press, the hall was packed. The gathering provided the basis for a regional organization that included both various neighborhood associations in Barcelona and organizations from surrounding towns and villages. It was not until later in 1936 that the groups in Barcelona and Madrid discovered one another’s existence. Mercedes Comaposada recalled that Lola Iturbe first mentioned to her that there was a group in Barcelona. But the person who really got them together was a young man named Martinez, the companero of Conchita Liano (who was later to become the secretary of the Catalan regional committee of Mujeres Libres). Martinez told Mercedes she must go to Barcelona to meet “those women.” In September or October, she visited Barcelona and attended a regional meeting of the Grupo Cultural Femenino to talk about the work of Mujeres Libres. The groups had begun with somewhat different foci. The Barcelona group wanted to encourage greater activism on the part of women who were already members of the CNT, whereas Mujeres Libres in Madrid wanted, in Mercedes’ words, “to develop women who could taste life in all its fullness …. Women with a social conscience, yes, but also women who could appreciate art, beauty.”2‘ Nevertheless, the Catalan women soon recognized their affinities with Mujeres Libres, and voted at that plenum to affiliate and to change their name to “Agrupacion Mujeres Libres.” Thus was begun what was to become a national federation. During these early months, the groups engaged in a combination of consciousness-raising and direct action. They created networks of women anarchists who attempted to meet the need for mutual support in union and other movement contexts. They attended meetings with one another. checking out reports of chauvinist behavior on the part of their male comrades and strategizing about how to deal with it. Aside from these forms of mutual support, the most concrete activity in which the Barcelona group engaged during this period was the establishment of guardertas volantes (flying day-care centers). In their efforts to involve more women in union activities, they had met repeatedly with the claim that women’s child-care responsibilities prevented them from staying late at work, or going out at night, in order to participate in meetings. They decided to address this problem by offering child-care services to women who were interested in serving as union delegates. Members of the group went to women’s homes to care for children while the mothers went to meetings. 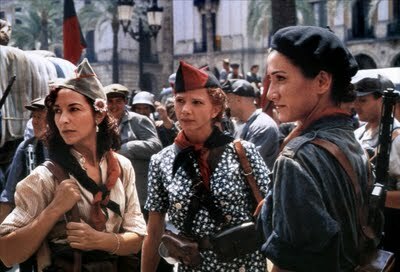 By the time the revolution began in July 1936, both the Grupo Cultural Femenino in Barcelona and Mujeres Libres in Madrid had been meeting for some time. They had established a network of women anarchist activists and had begun their work of consciousness-raising. They were well prepared to participate in the revolutionary events of July and to “retool” to educate themselves and other women for the work of constructing the new society. A good one for International Women's Day... or any day.